Growing up in apple country meant apple crisp, apple pie, apple sauce and the like were ever present during the fall and winter months. Baked apples are kid friendly and super easy to make, so they're a great cooking project to share with your children. While they're good year round, these are especially wonderful in fall and winter when apples are at their peak and we crave a warm dessert. 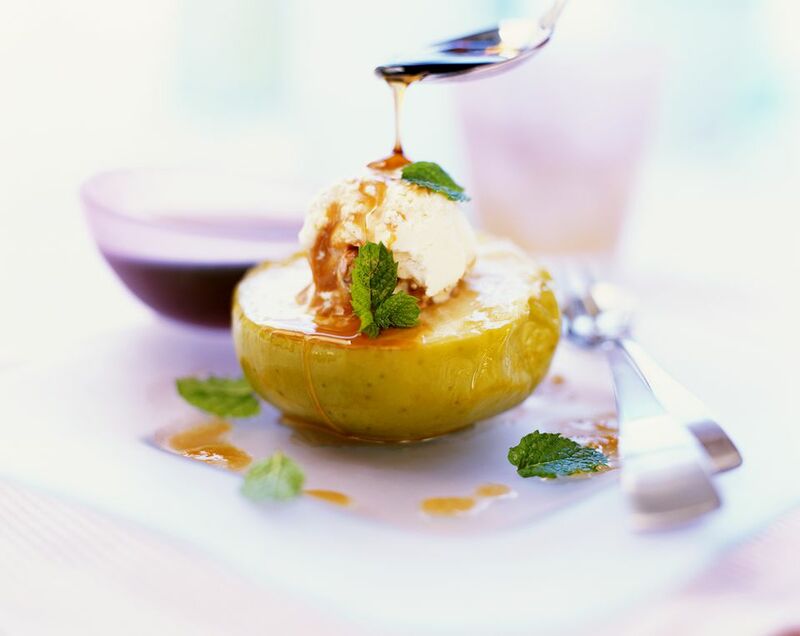 A healthy alternative to cakes and cookies, baked apples are also a great comfort food, and can be dressed up with Vanilla Tofu Whip or a dollop of creme fruit or gelato. This recipe can be prepared without the nuts and raisins, but we love the chewy and crunchy texture and sweetness they add. Choose good cooking apples, tart or tart-sweet, as noted below. Core the apples whole or, alternatively, cut them in half and remove the core with a small knife, creating a small "basin" in the apple halves. Sprinkle the cut side of the apples with lemon juice. Place the apples in a glass, ceramic or other non-reactive baking dish. Mix the maple syrup or agave together with the raisins, nuts, cinnamon and nutmeg. Fill the apples (or apple halves) with the raisin nut mixture. Pour the apple cider into the bottom of the baking dish and cover the apples with a lid or foil and bake for 25 minutes. Remove the foil, and baste the apples with the pan juices. Continue to bake the apples, uncovered, for an additional 10 to 15 minutes, or until they are tender but not mushy. Let cool slightly before serving. Drizzle the apples with the pan juices. Variation: Add 1/4 cup of finely chopped, crystallized ginger to the nuts and raisins. If you're making the baked apples for adults, try adding a generous shot of Calvados, Poire Williams (or other fruit brandy), or a nice brandy or cognac to the cider.